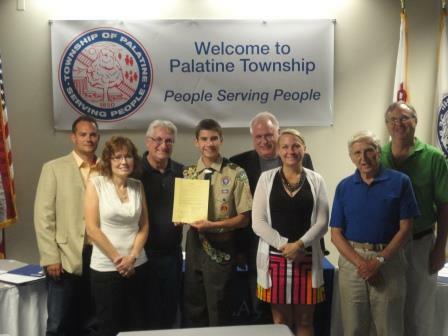 At the August 26 Board Meeting the Board passed a resolution thanking Eagle Scout Ken Piasecki for his project at Hillside Cemetery. Eagle Scout Ken Piasecki’s project called for a new path to be laid from the entrance drive at Hillside Cemetery straight to the cemetery’s flagpole. Also, the new path encircles the flagpole. Lastly, overgrown shrubs were removed from around the flagpole and new, low maintenance shrubs were planted. Eagle Scout Piasecki also donated some annual flowers that were planted around the cemetery entrance sign. The path is approximately 4 feet wide and is well over 50 feet long. The path was dug down approximately 4 inches and crushed red granite was used. On a sunny day the path looks stunning. The project took several weekends to complete. Members of Ken’s Troop 209 helped complete the project. Eagle Scout Piasecki also took special care to mark off the areas that had fragile headstones and to ensure that proper care was given to maintain them. Connie Rawa of the Palatine Historical Society said, “We think the path looks fantastic. Ken has done a great service for our community.” Historical Society President Joe Petykowski also commented that this path is a much needed addition to historic Hillside Cemetery.